I have been wanting to try out cauliflower rice for a long time. For some reason, I thought it would be hard to make. Boy was I wrong! Making cauliflower rice is super easy. I first learned how to make it from Tasty Yummies. She has a step by step tutorial. 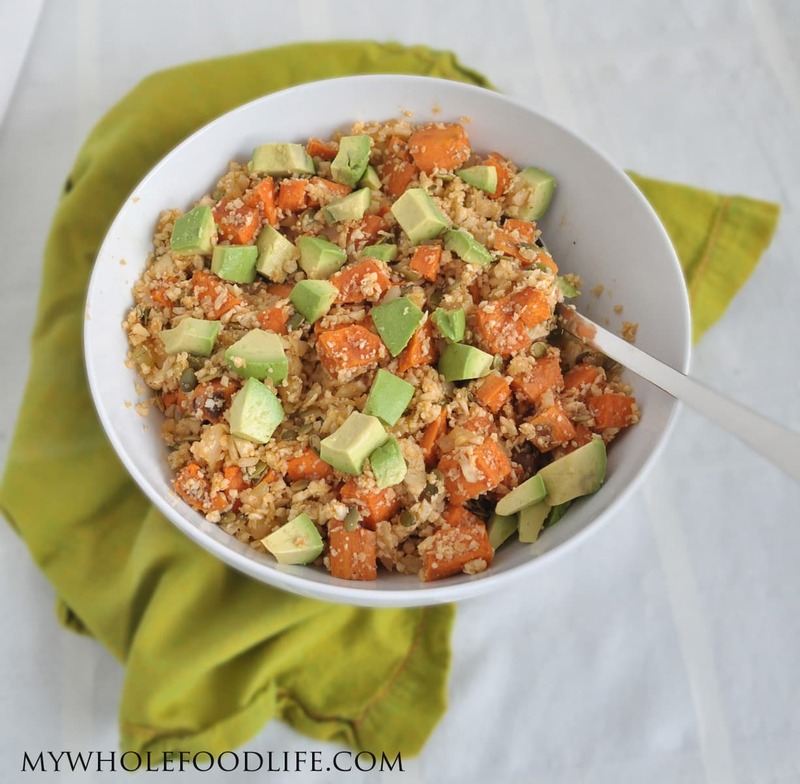 This smoky sweet potatoes and avocado with rice is delicious and very filling for a grain free dish! I have been venturing into grain free meals lately. I already have a zucchini pasta with avocado pesto and a spaghetti squash with pesto on the blog. I will be making this recipe again in the near future! I cooked the rice and the sweet potatoes the day before. So the following day I only had to quickly throw them together. Cauliflower rice has the same mouth feel as rice. I was really surprised how good it was! You have to try it. If you need a visual on how to make the cauliflower rice, you can watch this quick video. In a large bowl, combine the sweet potato, oil, smoked paprika, and chili powder. Toss every thing together to ensure the spices are mixed through the potato. Transfer potatoes to a lined baking sheet. Bake for 25-30, or until you can easily push a fork through the potatoes. Cut the cauliflower into florets. Throw 1/2 of the cauliflower into a food processor . Pulse until you get a crumb-like consistency. Do mix too much or it will turn to mush. Transfer the processed cauliflower into a saucepan with a couple teaspoons of oil. Saute for about 5-7 minutes. Set aside. Repeat the same steps with the other half of the cauliflower. In a large saute pan, add the onions with a little oil. Saute them on medium heat until they soften. About 5 minutes. Add the cauliflower rice, sweet potatoes, pepitas and some salt and continue to saute for another 5 minutes or so. Transfer the mixture to a bowl and serve with sliced avocados on top. Enjoy! This recipe seems pretty involved, but it's not if you cook the potatoes and rice ahead of time. Only add the avocado right before you are going to eat it. Otherwise it will brown. This should last a week in the fridge.